25th October, 1990 is a special date for the citizens of Kazakhstan. It symbolizes the end of the old history and the beginning of a new one. On 25th October 1990, date of the independence of Kazakhstan became a turning point in Kazakhstan's development. the Declaration of Independence was the first fundamental legislation of the new country. It is a legal, political and ideological document expressing the very principles of the realities of human existence, mostly human rights and protection of freedom, ownership, political plurality and division of powers. these fundaments became the base of the Constitution. On 16th December, 1991 Kazakhstan adopted the Constitutional Law on the independence of the Republic of Kazakhstan. In 2001 Kazakhstan celebrated the 10th anniversary of its independence. Kazakhstan is a very young independent state. But during this short period, large-scale institutional changes have occurred in the country. The people of Kazakhstan voted for a presidential form of government. A two-chamber Parliament was established, a court system created, the new capital determined. Fundamental national legislation was passed on the economy, social security and security. More recently, executive powers such as the Armed Forces, the Republican Guard, the Frontier Troops and the Navy were created. The economy has been radically transformed to a market economy, able to be integrated into the world economy. Kazakhstan has become a leading attractor of foreign investments in the CIS and Eastern Europe. Reforms are being carried out in social services and pensions. There are 16 political parties and over 2,500 non-governmental organizations in the country, ensuring political plurality and social stability. Kazakhstan has voluntarily refused to host nuclear weapons on its territory and declared itself as a nuclear-free country. Kazakhstan's foreign policy has aimed to achieve international guarantees of Kazakhstan's sovereignty and independence. Much work has been done in establishing friendly relationships with foreign countries. Over 120 countries have officially recognized and have diplomatic relationships with Kazakhstan, which is a full and active member of the UN and is strengthening its cooperation with the most authoritative international organizations including the EU, the EBRD, the IMF, MAGATE, the Red Cross, UNICEF and UNESCO. Kazakhstan has joined over 40 multilateral and over 700 bilateral agreements and treaties. Today we can say with confidence that Kazakhstan has an internationally acknowledged government and occupies a worthy place amongst world economies. 25th October 1990 - Declaration of State Sovereignty of the Kazakh SSR. 21st November 1990 - Law to improve government institutions and the Constitution of the Kazakh SSR. 12th August 1991 - the Ministry of Tourism is established. 29th August 1991 - Semipalatinsk Nuclear Test Site is closed. 11th September 1991 - Space Agency of Research and State Committee on Land and Land Use are established. 5th October 1991 - People's Party Congress of Kazakhstan. 16th October 1991 - Law on elections of President of Kazakh SSR. 1st December 1991 - first general elections of the President of the Republic of Kazakhstan; Nursultan Nazarbayev is elected. 10th December 1991 - The Kazakh Soviet Socialist Republic is renamed the Republic of Kazakhstan. 10th December 1991 - Decree on Diamond Reserves is signed. 16th December 1991 - Law on elections of the President of the Kazakh SSR. 21st December 1991 - the heads of 11 former Soviet republics sign the declaration of the Commonwealth of Independent States (CIS). 2nd January 1992 - Kazakhstan becomes a member of the OSCE. 27th January 1992 - first Kazakh gold bullion (10.5 kg) is smelted by Ust-Kamenogorsk Lead and Zinc Enterprise. 3rd March 1992 - the Republic of Kazakhstan becomes a member of the UN. 21st April 1992 - first letter of credence from a foreign diplomat - the Turkish Extraordinary and Plenipotentiary Ambassador to Kazakhstan. 25th May 1992 - Treaty of Friendship, Cooperation and Mutual Assistance with the Russian Federation. 4th June 1992 - Laws on the national flag, national emblem and national anthem. 20th June 1992 - first international railway service is opened between Almaty and Urumchi (China). 18th September 1992 - first national TV and radio broadcasting company is established. 18th October 1992 - the first Spiritual World Congress in Almaty with representatives of world religions , famous spiritual leaders, and educational figures from the US, Great Britain, Germany, Austria, Italy, Switzerland, India and CIS countries. 19th January 1993 - the Treaty of Basis of Relationship between Kazakhstan and Armenia is signed. 22nd January 1993 - The Altynalmas company is created with the state's participation to coordinate the extraction of precious metals, stones and their by-products. 26th January 1993 - the first Constitution of sovereign Kazakhstan is adopted. 16th February 1993 - UN office opened in Almaty. 10th March 1993 - the National Program of Privatization for 1993-1995 is published. 18th April 1993 - World Economic Forum in Almaty gathering over 100 heads of major international and national companies, firms and banks from 30 countries. 30th August 1993 - N. Nazarbayev asks the governments of nuclear powers to prolong the moratorium on testing nuclear, chemical, biological and other mass destruction weapons until 2005. 15th November 1993 - The national currency, Tenge (KZT) is introduced. 28th March 1994 - 22 Kazakhstan-Russian documents signed on political, economic and military cooperation. 29th March 1994 - in Moscow N. Nazarbayev offers to create a Eurasian Union of CIS countries. 26th April 1994 - agreement between Kazakhstan and the Chinese People's Republic on the Kazakhstan-Chinese border. 27th May 1994 - Kazakhstan becomes the 19th member of the NATO Partnership for Peace Program. 20th January 1995 - a package of 17 bilateral agreements is signed between Kazakhstan and the Russian Federation incl. the Declaration on Extension of Kazakhstan-Russian Cooperation. 1st March 1995 - the Assembly of the Peoples of Kazakhstan is established in order to strengthen social stability and interethnic accord. 25th March 1995 - republican referendum to prolong the powers of the President until the 1st December 2000 in order to preserve social unity and avoid deep polarization of the political and social situation in the country. 27th May 1995 - last nuclear weapon at the former Semipalatinsk Nuclear Test Site is eliminated. 1st July 1995 - Democratic Party of Kazakhstan is established. 30th August 1995 - a new Constitution is adopted by republican referendum. 15th September 1995 - Akmola (Astana) becomes the new capital. December 1995 - the first two-chamber Parliament is elected. December 1995 - Kazakhstan becomes a member of the Islamic Cooperation Organization. 31st January 1996 - speakers of the Senate and Majilis are elected on the first session of the new two-chamber Parliament. 6th February 1996 - 15 countries take part in the Conference on Interaction and Trust Measures in Almaty. 3rd April 1996 - Kazakh nationals can write their names and surnames in the traditional way. 1st May 1996 - first Day of the Unity of the Peoples of Kazakhstan. 17th September 1996 - 14 agreements signed on economic, scientific, technical and cultural cooperation between Kazakhstan and Georgia. 30th September 1996 - Kazakhstan signs the Treaty on Universal Prohibition of Nuclear Tests. 16th December 1996 - monument of Independence is opened in Almaty. 30th December 1996 - 1997 is declared Year of Memory of the Victims of Political Repression. 10th January 1997 - trilateral agreement on everlasting friendship between Kazakhstan, Kyrgyzstan and Uzbekistan is signed. 24th January 1997 - Law on the languages of the Republic of Kazakhstan is adopted. 13th February 1997 - 55 political parties, public associations, national and cultural centers of the republic sign an agreement on cooperating with the state in order to overcome social and economic problems. 5th June 1997 - first international forum on Kazakhstan's investment in climate (over 60 foreign companies and international organizations participate). June 19, 1997 - Law on small business development adopted. 10th October 1997 - the President's annual address about Kazakhstan - 2030. Prosperity, Security and Improvement of Welfare of All Kazakhstanis. 10th December 1997 - 1998 is declared the Year of National History. 10th December 1997 - National Fund to Support Disadvantaged People is created. 15th January 1998 - Agreement on Partnership and Cooperation between Kazakhstan and the European Union is signed. 20th January 1998 - official holidays and commemoration days approved: Day of the Defenders of the Country (7th May 7), Memorial Day of the Victims of Political Repression (31st May), Press Day (28th June), Sports Day (13th August), Day of Knowledge (1st September), Day of the Peoples of the Republic of Kazakhstan (22nd September), National Currency Day (15th November). 27th February 1998 - State Program to revive historic centers of the Silk Road and preserve and develop the cultural heritage of Turkic states and create tourism infrastructure. 27th April 1998 - the Agency Supporting Small Businesses is founded. 4th June 1998 - 2nd Kazakhstan Investment Summit with 160 companies from 24 countries. 10th June 1998 - international opening of the new capital Astana. 26th June 1998 - Law on national security. 30th June 1998 - Council of Foreign Investors is established. 2nd July 1998 - national financial institution NSBK Group is created to develop the financial system. 6th July 1998 - Declaration between the Republic of Kazakhstan and the Russian Federation on everlasting friendship for XXI century is signed. 9th July 1998 - Anti corruption Law is signed. 17th July 1998 - Memorandum on border between Kazakhstan and Kyrgyzstan is signed. 21st July 1998 - Law on joint stocks is published. 18th September 1998 - Civil Service Agency is established. 30th September 1998 - the President offers to continue further democratization of society by simplifying elections, reducing membership fees, increasing the role of political parties which have over 10 seats in the Majilis (lower chamber) and increasing the role of NGOs. 17th November 1998 - Civil Party of Kazakhstan is founded. 9th December 1998 - Anti-corruption Government Program 1999-2000 is approved. 17th December 1998 - Presidential Decree on the national commission for family and women is published. 24th December 1998 - Law on Marriage and Family. 1st January 1999 - declared the Year of Unity and Succession of Generations. 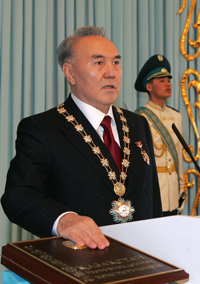 10th January 1999 - N. Nazarbayev is re-elected President for seven years with 80% majority. 1st March 1999 - Republican Party Otan is founded (it includes the democratic party "People's Unity of Kazakhstan", the Liberal Movement of Kazakhstan and the movement "For Kazakhstan 2030"). 19th May 1999 - Kazakhstan's Tourist Union is founded. 3rd June 1999 - 3rd international Almaty Investment Summit with over 160 companies from 22 countries. 11th June 1999 - Law on Education. 4th November 1999 - Treaty on long term cooperation between Kazakhstan and Byelorussia for 1999-2008 is signed. 30th December 1999 - 2000 declared the Year of Culture Support. 17th February 2000 - the anti-drug trafficking and anti-drug addiction agency is established. 29thJuly 2000 - the last shaft for nuclear tests at the former Semipalatinsk Nuclear Test Site is eliminated. 16th March 2001 - Security Council approved a new Foreign policy concept for Kazakhstan. 20th March 2001 - State program of national information, infrastructure formation and development. 27th March 2001 - the CTC pipeline begins to operate. 29th April 2001 - Baikonur launches Soyuz -32 with the first space crew visiting the international space station. 22nd September 2001 - state visit of pope John Paul II to Kazakhstan. 16th November 2001 - Presidents of Kazakhstan and Uzbekistan sign Kazakh-Uzbek border treaty. 28th January 2002 - Summit on governmental cooperation in Central Asia and Summit of Heads of CIS countries. 26th March 2002 - Washington declares Kazakhstan a market economy. 24th April 2002 - N. Nazarbayev and the President of Iran M. Hattami sign a Declaration on amicable relations between the two countries. 25th April 2002 - first Eurasian media forum in Almaty. 13th May 2002 - N. Nazarbayev and V. Putin sign a treaty on the northern boundaries of the Caspian sea. 15th July 2002 - N. Nazarbayev signs the law on political parties. 17th October 2002 - negotiations between N. Nazarbayev and Kofi Annann, UN General Secretary in Astana. 23rd February 2003 - the presidents of Byelorussia, Kazakhstan, Russia and Ukraine sign a statement to create a common economic zone. 14th March 2003 - after a 12-year interruption Kazakhstan resumes exports of black caviar and sturgeons to Europe. 25th April 2003 - law on compulsory social insurance. 2nd July 2003 - N. Nazarbayev signs law to ratify a treaty between Kazakhstan and Azerbaijan on the southern boundaries of the Caspian sea. 23-24th September 2003 - Astana Congress on world, traditional and national religions. 15th October 2003 - N. Nazarbayev attends the first NGO congress Civil forum. agreement with Italy on international transportation of the passengers and goods by motor transport. 16-19th May 2004 - state visit to China, agreement on construction of Atasu-Alashankou pipe-line is signed. 21st June 2004 - WHO anti-tobacco convention . 18th January 2005 - Kazakh-Russian treaty signed over 7,591 km border. 2nd June 2005 - 50th anniversary of cosmodrome Baikonur. 5th July 2005 - Shanghai Cooperation Organization (SCO) Council meeting in Astana. Declaration of SCO member states. India, Pakistan and Iran declared SCO observers.